I’ve been pretty out of touch this week since I got hit with a nasty, nasty head cold. I thought it would just be an annoyance until I had to fly to LA on Wednesday but that did me in (my ears have never hurt like that ever). By the time I flew back on Wednesday night I felt too bad to even knit! That is sick. I missed work both Thursday & Friday, which isn’t great timing because I’ll be off starting next Thursday for the wedding but I’m certainly glad it was this week because I can’t imagine feeling like this on my wedding day! Plus Matt has had a cold, the best man called yesterday to say he was sick & the maid of honor has had an off & on sore throat…ok, everyone has 7 days to rest, drink oj & get better! I can’t remember the last time I felt so bad I didn’t to knit & it was hard to get myself to not feel useless sleeping & watching tv all day. 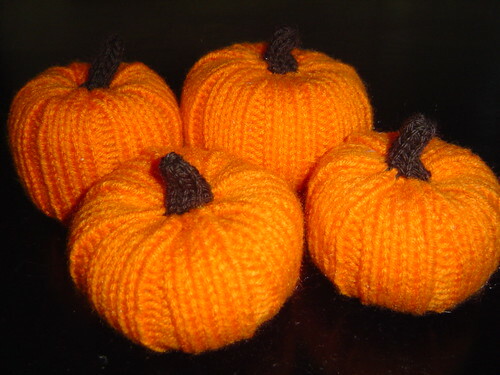 Yesterday I started to feel a bit better and knit up these simple little pumpkins. The pattern is from curlypurly & is super simple. I added stitches on some & rows on others to make different sizes & shapes. It was a great use of the orange yarn from the Giants Stitch n Pitch bags. I made all four of these from one ball of yarn. They’ll be part of an upcoming window at Noe Knit. 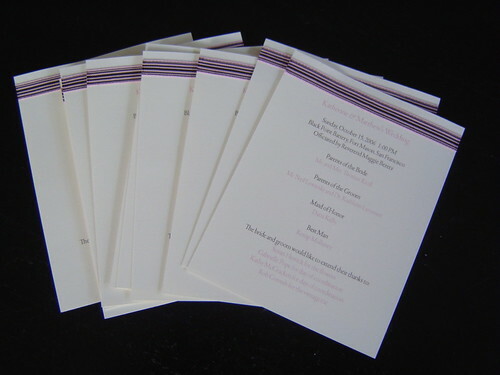 The programs for the wedding are almost finished just a few more ribbons left to glue on. I plan on taking it pretty easy the rest of the weekend. My friends are throwing me a brunchelorette today (a much calmer version of a bachelorette)a Foreign Cinema which should be fun. Tomorrow I’m running a felted bowl workshop at Noe Knit. The rest of the time will be spent at home doing some final organizing & listening to the Blue Angels fly over my apartment…ah yes, its Fleet Week & we live in a flight path. 13 years ago by Kat in Halloween , Holiday , Knitting , Needlecraft | You can follow any responses to this entry through the RSS feed. You can leave a response, or trackback from your own site. I hope you start feeling better before the BIG DAY!!!! I know where you’re coming from, believe me. This has been a bad year already for colds/flu/whatever! I hope you all are feeling so much better before the big day, like 100% better! Thanks for the pumpkin pattern, they are adorable and I think I could even make some!! I’m putting orange yarn on my shopping list right now. And I LOVE those pumpkins! I love those pumpkins and your invitations are gorgeous! Here’s my best nursing advice: drink lots of fluids, sleep, eat well and think positive thoughts! Congratulations! i love that pumpkin pattern, last year i made a couple – i wonder where they got to…take it easy, if you have the same cold that everyone here in VT has it takes forever to go away. Thanks for stopping by my blog. Do hope you are feeling much better soon, and I hope all is well for your big day.